Maceration is a time-honored, slow method of herbal extraction. The healing constituents of an herb are transferred to either organic corn or cane alcohol or pure vegetable glycerin in combination with distilled water. Unlike pills and capsules, these concentrated plant extracts, or tinctures, enter the bloodstream quickly. They can go right under the tongue and not have to be broken down by the digestive system or be put into water or juice. This process preserves the potency of an herb and they last for years. Glycerin extracts are usually gentler and well suited for children, people with allergies or aversions to alcohol.They are slower to be absorbed into the bloodstream and have a shorter shelf life as well. We use only certified organic gluten free cane or corn alcohol and pure vegetable glycerin sourced from Coconut leaf in our micro-batch processing of hand selected. We often are able to use fresh herbs in season that retain their full vitality. 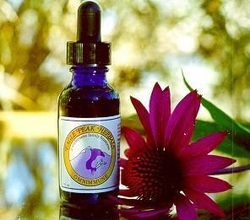 Our tinctures come in 1 oz, 2 oz, and 4 oz blue glass dropper bottles. Larger volumes are available in amber glass bottles.